Penny Hammel joined the University of Miami in 1980 as the No. 1 junior girls golfer in the country and left in 1984 as one of the most heralded golfers in UM history. After a slow transition to the collegiate game and a career-threatening car accident, in which she suffered a broken left wrist a week before the NCAA Championships, Penny recovered to capture not only an individual National Championship in 1983, but led the Lady Hurricanes to a team title in 1984 as well. As a player, she was known for her determination and desire to be the best, which was exemplifiled in the 1983 NCAA tournament. Penny began the third round of the tournament three strokes behind the leaders before entering the final round tied for the lead. She then shot a 5-under par 69 in the final round for a six stroke victory and the National Championship. 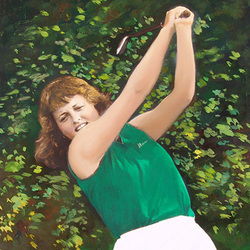 During her career, Penny was named All-American twice, was selected by Golfweek Magazine readers as the 1983 women's Collegiate and Amateur Player of the Tear and won the 1982-1983 Broderick Sports Award as the Outstanding Woman Colligate Athlete in Golf. She was selected to the Curtis Cup team in 1984 and led the U.S. squad to the title defeating teams from England and Ireland. Penny joined the LPGA after her senior season and enjoyed a successful professional career.